44-30 Purves Street [The Court Square Blog]: Environmental surveying is underway at the development site at 44-30 Purves Street — in Queens Plaza, of Long Island City — where Brause Realty has plans for a residential building of “around 250 rental units.” Construction fencing has gone up around the perimeter, but building applications have yet to be filed. Domino Sugar Redevelopment [NY Daily News]: Two Trees is set to continue the partial demolition of the Domino Sugar Factory — in Williamsburg — to make way for their five-tower and $1.5 billion redevelopment project; scaffolding could be erected to dismantle the “Domino Sugar” sign — which is to be restored — in the next few days. Western Queens Rezoning [NY Daily News]: Community leaders in western neighborhoods of Queens are vocalizing to rezone specific areas to “allow for taller buildings and potentially denser development” in an effort to produce enough stock for the housing demand. Areas highlighted are parts inner Long Island City, Northern Boulevard near 45th Street, and the blocks along Broadway and Northern Boulevard in Woodside. 5 West 125th Street [New York Post]: Large commercial tenants have signed on to lease space at a seven-story and 30-unit mixed-use building currently under construction at the through-block site of 5 West 125th Street, in Harlem. 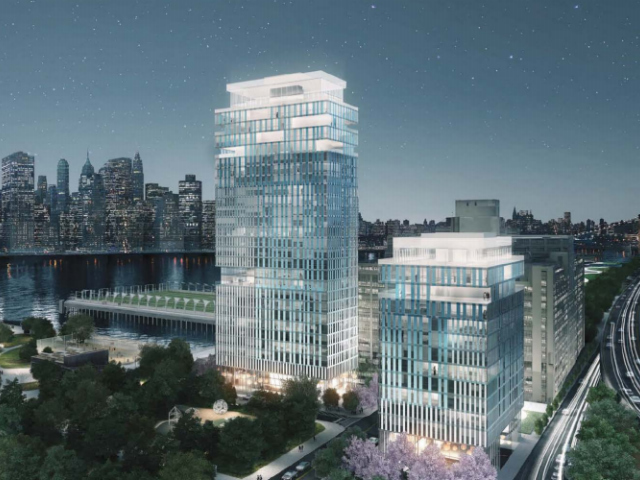 The 130,000 square-foot building will contain three, 30,000 square-foot commercial floors; Bed Bath & Beyond and WeWork have already leased a floor each. 954 Bergen Street [Brownstoner]: Being developed by Brookland Capital, façade installation has made headway at the six-story and 36-unit residential building at 954 Bergen Street, in Crown Heights. Designed by Issac & Stern, the building appears almost completed; opening is scheduled for September.